A magical teal coloured sweater with an off white fairisle style yoke. Crafted in Scotland with 100% pure wool. The cropped hemline and narrow rib make it perfect for wearing with skirts and trousers alike. 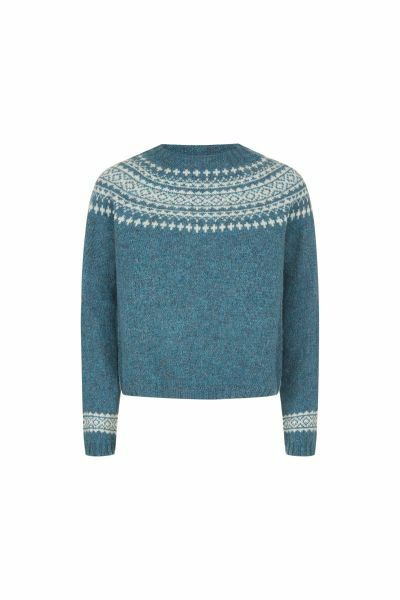 The Sherbet sweater in teal has been designed so you can carry on wearing Fair Isle sweaters over the warmer season, as we are always rather sad when we have to put our winter version away. Sherbet is simple in shape with a neat round high neckline. 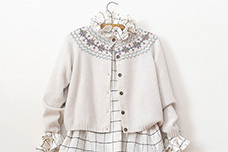 A sweet fairisle style design in off white creates a yoke around the shoulders. 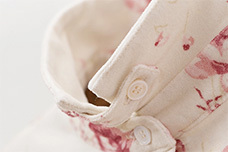 Little rib detailing finishes the neckline, cuffs and hem. Pull on with long semi-fitted sleeves, Sherbet has an overall snug fit. 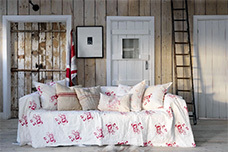 Bright in colour, she will cheer up those cloudier summer days. The Sherbet Sweater has been knitted with teal pure new wool. Sherbet was made in Scotland. 100% Wool. Caring for your Knitwear. We recommend that you hand wash Sherbet in cool water using Ecover Delicate Laundry Liquid. Remove excess water after washing and ease gently into shape whilst damp. Can be dry cleaned. Press with a cool iron if necessary. Lay out flat to dry . Please do not bleach or tumble dry Sherbet.